What a surprise to discover this emergency coin from Weissenfels (White Meadows; Saxony), Germany dated 1918. 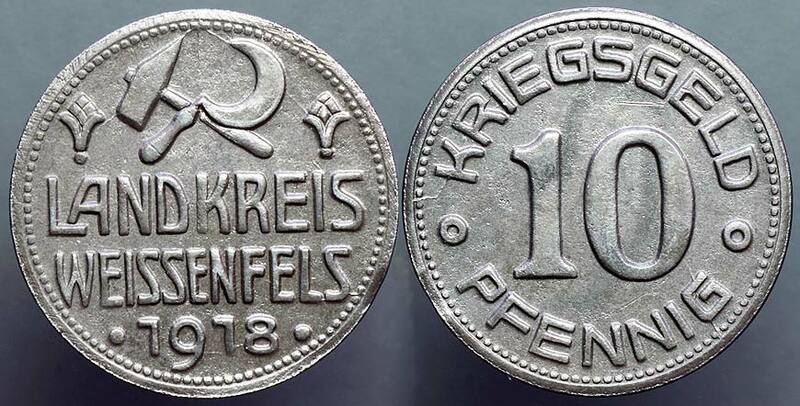 It was issued as part of the huge series of "Notgeld" coins during the early Weimar Republic period of high inflation, and hoarding following World War I. 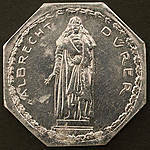 This coin names the denomination as "KRIEGSGELD" (war-time money) rather than 'Notgeld' (emergency money). I have yet to see anyone separate the two designations, but it would seem obvious that notgeld is probably seen more often with dates beginning in 1919. I've been doing research on the origins of the Hammer & Sickle symbol used as a symbol for communist movements the world over. While there is evidence that the symbol was chosen as early as 1917 or 1918 based upon a design contest held by Lenin (won by Yevgeny Kamzolkin), there are also leads to Lev Rudnev even a bit earlier. See Chile for coins showing the Hammer & Sickle as early as 1895 from a pattern of 1894 by Tasset and Roty. Tasset also designed a coin for Romania (1911).